So, i have one of my first catches ever, (Camponotus pennsylvanicus) and she's been busy, meet Freddie Mercury. She was caught on 5/24/18, and laid her eggs 6 days later. When i checked on her on 7/6/18, she already had her first fan! Now, on 7/14, shes up to a healthy fan club of 7 workers! 2 seem overly eager to bust out and explore, as they are pulling at the cotton. My question here is.. is it time for them to get an outworld and some food, or should i feed them in their tube, on wax paper? 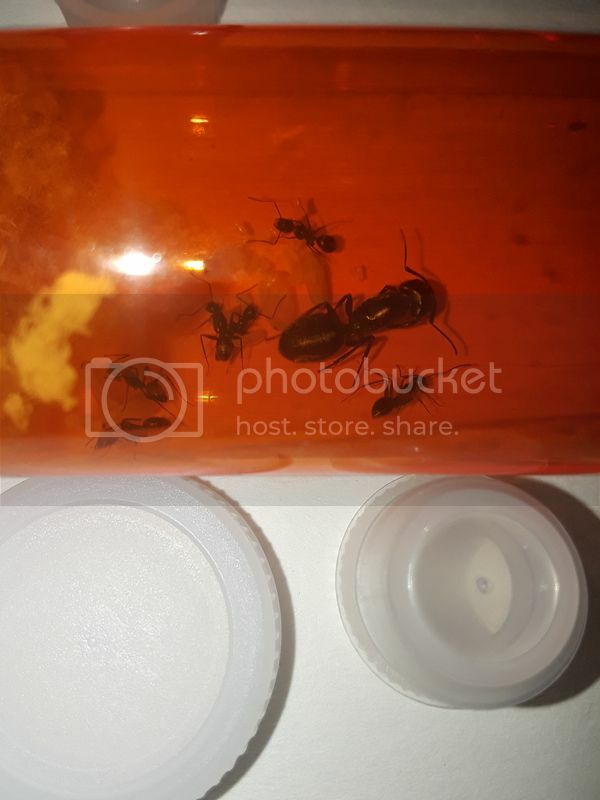 This is my first time keeping ants, and i just dont want to get anything wrong. Any help and tips would be appreciated. Here's a pic of my hard working performer and her adoring audience. Re: Time for an outworld!? A small outworld would be great, makes it easier to feed and clean without disturbing them too much. I use the test tube portals from AntsCanada. Never hesitate to feed them! Ants love food!